The original recipe calls for Italian seasoning, which I don’t actually own (surprising, I know). So, I substituted seasoning that I thought might be in Italian seasoning. I was feeling a bit lazy and so didn’t want to look up what was actually in it. Use a veggie peeler to cut the zucchini into thin slices. This takes a little while, but it helps once you get a rhythm going. Slice the bell pepper into thin slices. Season the zucchini and bell pepper with olive oil, oregano, sage, basil, sea salt, and black pepper. Set aside to marinate while you get the dough ready. Mix the flour and salt in a mixing bowl. Rub the fat into the flour using your finger tips, until you have rough chunky-ish bread crumbs, slowly add the water, a tbsp at a time and gently mix, keep adding the water until you have a nice rollable dough and bring all the dough together. Wrap in plastic wrap and refrigerate for about 1 hour. sprinkle an 8″ ceramic pie dish with flour and roll the pastry out to a bout an 1 1/2″ bigger than your pie dish, gently transfer the pastry into the dish and carefully press into shape. He suggests that you then put this in the fridge before trimming the edges. I did not do this. I’m not sure it made a big difference in our case. Blind bake the crust for 8 minutes (by covering in tin foil) and then open it up and bake for another 8 minutes. 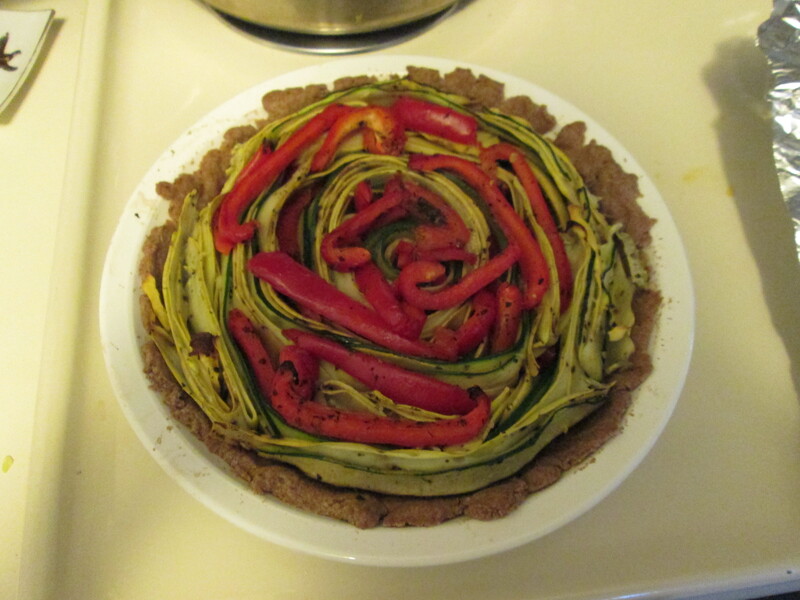 Arrange the zucchini and bell pepper. Wrap one slice of zucchini at a time. Adding in the bell pepper does make it difficult to arrange. I did tuck it into the rolled up zucchini sometimes rather than trying to roll it in initially. Bake for 20 minutes or until the tops of the zucchini start to crisp a little. I baked everything at about 350 F.
Use a serrated knife to cut the tart and try to hold the filling in place with one hand or a pie server. Completely cool before serving (I also didn’t COMPLETELY cool before serving…it worked out fine). It is recommended to garnish with sesame seeds. I forgot about this, but I’m sure it would be delicious if you chose to do this. I have to admit, I did not love the crust. Next time I will look for some other crust options (or possibly go non-vegan for the crust). beautiful! I’ll keep this in mind when I have company because it’s so pretty!